This is the third high-level & very revealing email SureFoot Helms has sent to the Live With Regis & Kelly Show. He's discovered the alien encroachment goes even deeper, yet the show has yet to respond. The question remains: has it all been in vain? We'll just have to wait and see! Regis … Shh, Shh this is top secret! My investigation has turned up some unbelievable stuff! 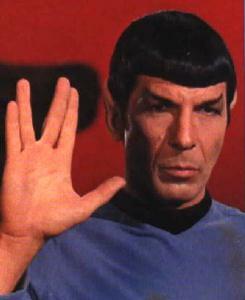 Michael Gelman, yes your chief strategist, team leader and so-called producer is really a Vulcan. I know, I know … it’s hard to believe … but Regis you’re a reasonable man. Okay, I’m just like you … I LOVE that kid! But, check out the evidence. Gelman’s ears point skywards … okay he’s had some surgery and the pointed tips have been trimmed, but their shape … Regis … their overall shape … Vulcan. 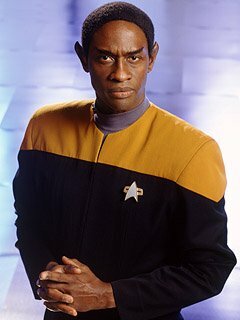 Look at Gelman’s overall stature, slim … narrow … compare him to Tuvok and Spock. They’re dead riggers … all Vulcan. Also … listen to how he communicates when either you or Kelly ask him about some show detail. He’s matter-of-fact, short and to-the-point … Vulcan-style, I tell you. And don’t get too impressed with his Yoga talk. It’s a cover-up. He’s really practicing Vulcan mind-meld techniques. Be aware Regis. The Vulcans are here and specializing in the management of entertainment companies. They are influencing stuff, by planting seeds in unsuspecting minds, i.e. via mind-meld techniques! My sources indicate that Gelman is trying to curb your moonlighting activities. Okay, you took off for over a week to guest host “Who Wants to Be a Millionaire” but that was just to make it look good. The fact is that Gelman was the one who got you out of the chair in the first place and got Meredith Vieira hired. You see … the Vulcans don’t want their chief talent to stay away from the stage too long. Moonlighting takes energy away and what if you ditched Live? After all when Elvis leaves the building the concert is over. They can’t take that chance Regis! Not convinced yet? Okay, I’ll continue. Mark my words, this coming season what do you think is going to happen to Notre Dame Football? I can hear it now. 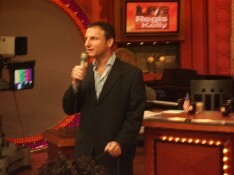 You see Regis, Gelman goes over there and plants negative seeds in the minds of the starting quarterback. It manifests as a bad pass, a fumble or interception. You can’t win football games when that happens! Gelman doesn’t want you to go over there and party with the team, guest speak to the student body and celebrate victories. It takes energy away from Live! Luckily Kelly is so darn talented she can make a street bum guest host look good but the show is just not the same when you’re out of town! Watch out for those Vulcans. Okay wait until you see your next contract … it will have a very limiting “moonlighting clause.” Okay enough said but don’t watch Gelman doing Yoga! Regis, it’s all about mind control. I also heard the Borg is hunting for more DNA. Seven-of-Nine is patrolling the skies again. She wants to beam somebody up and give him the full treatment. You can only imagine what that is! I hear you’re on the hit list again. Keep an eye open! In my case I’m trying to get on the damn list … I should be so lucky! Okay, Regis … that’s it. Only now I know why your team doesn’t email me or ever hires me. It’s not my very pricey fee. Gelman gets on the computer and deletes my messages. He doesn’t want any alien snoop to blow his cover. Shh … Shh, the Vulcans with those big ears ... hear everything!